1. Thaw the frozen strawberries and puree in a blender until smooth. Cover and store in the refrigerator. 2. Spread each tortilla with 1/4 cup cottage cheese. Place 2 tablespoons each of sliced strawberries and chopped peaches over the cottage cheese. Spoon 1 tablespoon of strawberry sauce over each tortilla. 3. Spoon an additional tablespoon of sauce onto each serving plate. Roll up and place seam side down on serving plate. 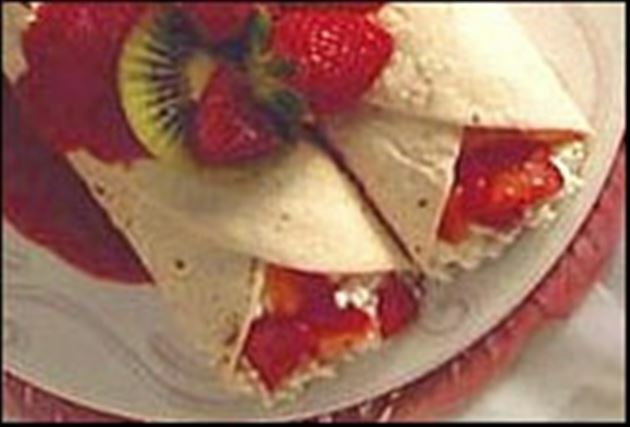 Top each tortilla with remaining strawberry sauce and garnish with sliced kiwi and strawberries. Enjoy this delicious strawberry breakfast crepes Mexican food recipe!